Are You Wild Enough for Niagara’s White Water Walk? 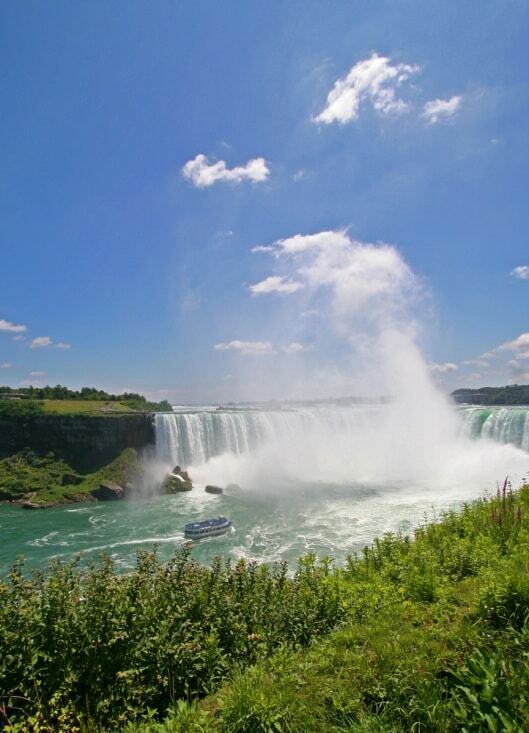 There is no denying that the majestic waterfalls are the star of the show here in Niagara, and most visitors are eager to see the falls from every possible vantage point. While the public parks, boat cruises and behind the falls tours each offer their own unique perspectives, there is one more point of view you shouldn’t overlook: From the stretch of whitewater along the Great Gorge, the section of the Niagara River leading up to the falls. 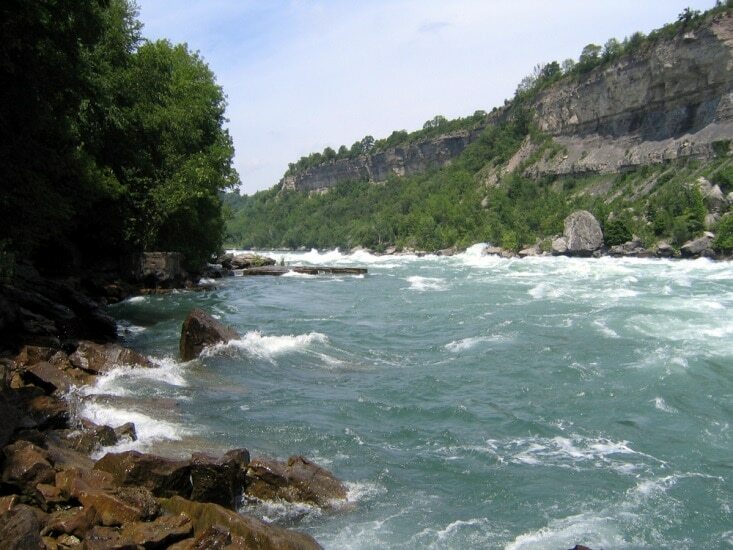 Niagara’s White Water Walk, located about 4 kilometers north of Horseshoe Falls, on the WEGO bus route, is an opportunity to view the rushing water from a slightly less crowded and more natural setting than closer to town. Here, the water rushes past at about 48 kilometers per hour (30 miles per hour) as it makes its way toward the falls. The extreme speed of the water, combined with the narrowness and depth of the Gorge, create some of the most intense rapids anywhere in North America. In eastern North America, whitewater rapids are measured on a scale on 1 to 6, with 1 describing fairly calm and flat water, and class 6 reserved for rapids that have high waves, steep drops and dangerous obstructions. In most cases, class 6 rapids are considered impassable — and the Whirlpool Rapids of the Niagara River along the White Water Walk are rated a class 6 at all times. At any given moment, the waves here are about 3-5 meters tall; after severe storms and in the early spring, the waves can be much higher. What makes the Whirlpool Rapids unique is that the waves are not caused by the water rushing over rocks and boulders, like other rapids, In fact, experts believe that the river floor in this section of the Niagara is actually quite flat and smooth, thanks to the force of the water rushing past. Instead, the narrowing of the gorge causes the rapids: Here, the river narrows to just about 5 meters across, and the depth drops suddenly from 15 feet in the rapids to 61 meters at the falls. The result is rapids unlike any other in North America. The water isn’t the only attraction here at the Whitewater Walk. From the boardwalk and observation areas, you can see the 410 million year history of the Niagara Gorge in the layers of rock on the walls. The easiest way to get to White Water Walk is to take the WEGO shuttle from your hotel. At the walk, you’ll take an elevator down to the boardwalk, which extends about 1,000 feet along the water. At two points along the boardwalk, you can take steps down to observation decks closer to the river. Unlike some of the other waterside experiences in Niagara, you can view the power of the river without wearing a raincoat or worrying about your camera; while you might feel a few drops of water here and there, it’s nothing like the constant mist of the tours behind the falls or the cruises to the base of the falls. Visiting the White Water Walk offers another view of Niagara Falls, providing a glimpse of where the water begins its journey over the falls. It’s worth carving out a few hours of your itinerary to experience this natural wonder.